The Wharfedale Pro EZGO is an innovative portable PA solution that is ideal for announcement, presentation and entertainment applications. EZGO is simple to use and requires no specialist or technical knowledge to stage a professional performance. Its class leading usability is matched to genuine professional audio quality. Rapid setup and near non-existent take-down times ensure that EZGO will always keep your presentation stress free and professional. Audiences of up to 200 people are easily covered with the 70W amplifier and dual 5″ full range drive units. The EZGO is battery or mains operated. Optional user installable modules include a USB player and wireless microphone module. The retractable handle and recessed wheels make transportation easier than ever before, an optional tour bag provides additional protection during use and transit. 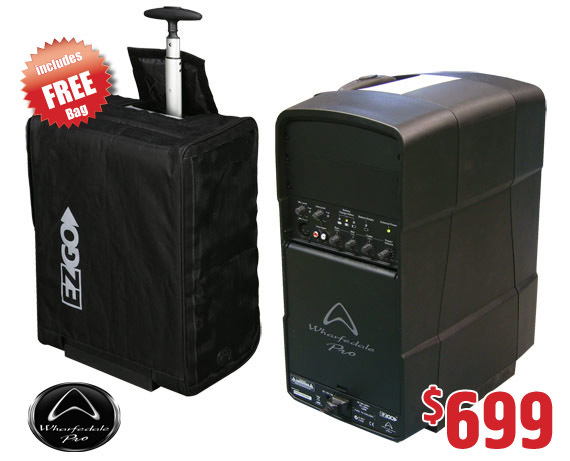 The compact size of the EZGO means you can actually take it onto an air craft as carry on luggage – ideal for travelling sales people, presenters, performers and anyone who wants to be heard. • Switching mode power supply – works world wide. for great deals delivered to your inbox every week!